Who could even dream of thinking, period, when in a small dance club where the pulsating floodgates of club music are being let loose. Here's a thought, though. What if you could hide messages in the tempo of that pounding music? It's being done. A Polish scientist knows how to hide secret messages in music and is exploring results. Thursday, ZME Science talked about his dealings with trance and techno, "electronic music meant to shake your mind and body with stomping rhythms and varying tempos." The report in ZME Science said that cybersecurity researcher Krzysztof Szczypiorski has produced tunes with hidden coded messages nested inside tempo variations. The concept is musical steganography, and it involves coding messages in music. Tibi Puiu in ZME Science shared some history. "As far back as the 16th century in the time of Benedictine monk Johannes Trithemius until more recently, artists have toyed with musical steganography to subtly disseminate a message by doing things like mapping notes to letters." Puiu ran down how the researcher did it: The latter re-wrote some tunes. "The message he wanted to convey wasn't coded in the frequencies, but in variations of the tempo—a technique Szcypiorski calls StegIbiza. It's Morse code, basically. To indicate a dash, he speeds up the tempo for a single beat; to indicate a dot, he slows it down, MIT Technology Review reported." Katherine Noyes of IDG News Service said that to prove his concept he used Apple's Logic X Pro music production software to create covers of five popular songs. She said that songs were arranged without vocals in techno, hip-hop, and trance styles using instruments available in Apple's software. Motherboard described the technique, saying, "just like Morse code, letters are ascribed a dot-and-line series, but the "dot" is a slight increase in tempo, and the 'line' is a slight decrease. By modulating the tempo ever so slightly, an entire sentence can be communicated over time. To decode the messages, you could use an algorithm that analyzes the beats per minute or simply listen very closely, if your ear is finely tuned enough." The paper is on the arXiv server. 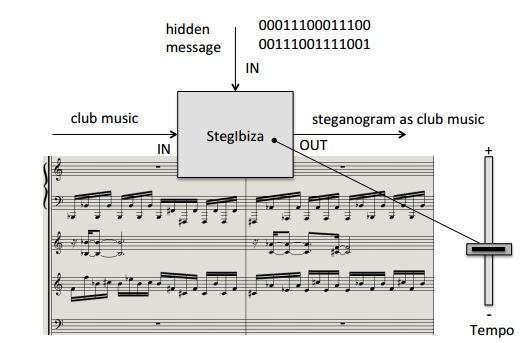 The title is "StegIbiza: New Method for Information Hiding in Club Music," by Krzysztof Szczypiorski. "The results show that the method is clearly viable. When Szczypiorski changed the tempo by more than 3 percent, about half the listeners noticed the difference. But when the change was less than 2 percent, nobody noticed. 'At this level the experiment was stopped, because the rest of the party did not care about the music,' he says." Boring. Try using the University of Washington's citizen science game named Fold It (https://www.fold.it) that mimics protein folding. The games uses all 20 Amino Acids and each has a (oh, we are speaking English for this) single letter used as an abbreviation. So, 20 letters containing 4 vowels, the rest consonants. Who needs to play with beats per minute, just create your own protein and assign the AA's that contain the message. How long of a message can be sent? 100's of characters long would be really easy. Then share that protein with your compatriot so he/she/it can read the message. The only message in music today is that grown men listen to music formerly listened to only by 13 year old girls. Music have always carried subtle messages, to be decoded subjectively by each listener (although common 'contexts' existed; you couldn't possibly interpret a scherzo as saying, "Cry you eyes dry! "); even composers might not have been sure what message they wanted to convey. See music semiotics. The new thing with this it's literal, in human language...more explicit (ironic, given it's supposed to be secret) and more controllable (tunable?) with unprecedented precision. No longer is there subtlety (excuse my saying!). I also like how Puiu acknowledges the technique's ancient origin. Apparently, Polish scientists are humble, unlike others who feel compelled to call every other proof-of-principle a "breakthrough" and to denigrate previous attempts no matter how recent.